One of the most popular uses for the Raspberry Pi is for video game emulation. Using RetroPie software, you can relive those classic games of yesteryear using a computer the size of a credit card. And of course, for those same folks going to the trouble of running emulation software on their Raspberry Pi, the next logical step is to 3D print a custom case. This is usually in the form of their favorite vintage hardware, whether it’s a Nintendo Entertainment System or a Sony PlayStation. 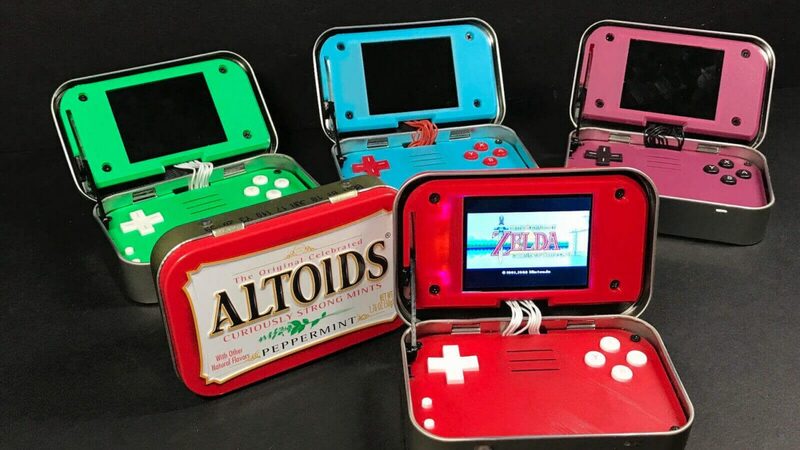 The mintyPi 2.0 also combines Raspberry Pi and 3D printing, but this project takes things to a whole other level by tucking everything away inside an Altoids tin. Until you pop open the lid, you may never have guessed it was actually a handheld games console. The mintyPi 2.0 is a true labour of love by a maker who goes by the handle of Sudomod. Earlier attempts for his DIY handheld console were rudimentary; while he succeeded in cramming everything into a tiny tin box, it was a mess of wiring and exposed parts. Just like a regular handheld gaming console, the mintyPi 2.0 features an integrated display and a classic controller layout. The handheld also features a 3D printed hinge to hold the screen open while playing. And there’s a USB sound card to hear those jaunty chip-tunes in all their 8-bit glory. As well as the cosmetic changes, the mintyPi also takes advantage of the recently launched Pi Zero W to add wireless connectivity. This should prove useful for software updates, custom configurations, or just downloading a copy of Ghosts n’ Goblins. But keep in mind that the Raspberry Pi Zero W has limited processing power. That means technically challenging games may prove too much for this device to emulate. In any case, Sudomod is planning to release a detailed guide on how to build a mintyPi of your very own. Until then, be sure to follow his blog for more excellent tech projects inspired by the Raspberry Pi and 3D printing. Posted in Uncategorized and tagged #3d Printer, #3dprinter, #8-bit, #affordable, #Altoids, #build, #cheap, #christmas, #console, #controller, #diy, #download, #emulator, #gaming, #Graphics, #guide, #hacked, #handheld, #hendheld, #mcsc, #mintyPi, #mintyPi 2.0, #Nintendo, #Pi, #Pi Zero W, #Playstation, #present, #projects, #raspberry, #RaspberryPi, #Sony, #sudomod, #TheMessiah, #wireless.